It’s been so hot and humid these last few weeks that when I step outside it feels like the air around me is sweating. My naturally wavy hair, which I straighten these days, has developed a persistent swoop that no amount of round brushing and product will coax flat. In this kind of weather, I feel the need to change my clothes at least three times a day and usually shower at least twice. It is mid-August, which is when we come to expect this kind of weather in Chicago. But this year has had what feels like a longer than average run of it with little relief. Mostly, I’ve tried to avoid going outside. Which is, uh, an unrealistic strategy. A better strategy, I’ve found, is treating myself to a cold drink after I’ve made one of those inevitable forays into the unpleasantness. Which brings me back to the Mezcal Mule. 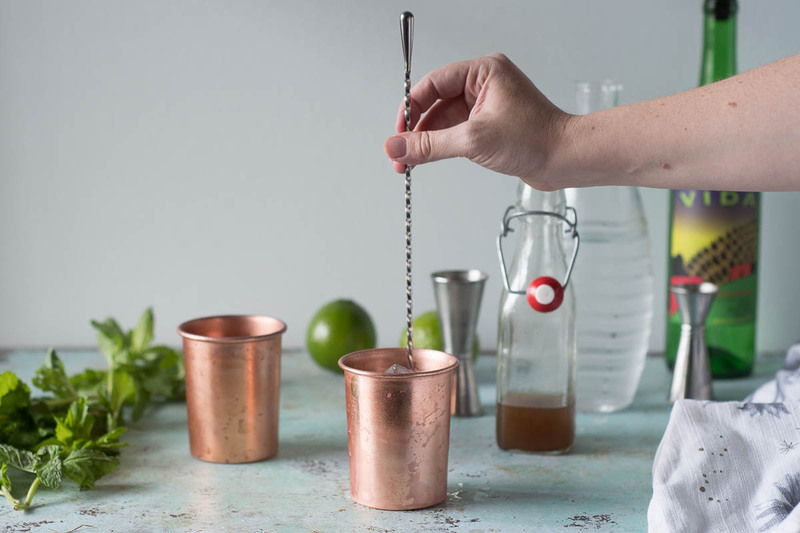 It’s a variation on the classic Moscow Mule, which is traditionally a vodka drink. I’m not much of a vodka person. I tend to think any vodka drink would be more interesting with gin or just about any other base spirit, pretty much all of which have more character. But if you’re a fan of the classic, by all means drink it that way. 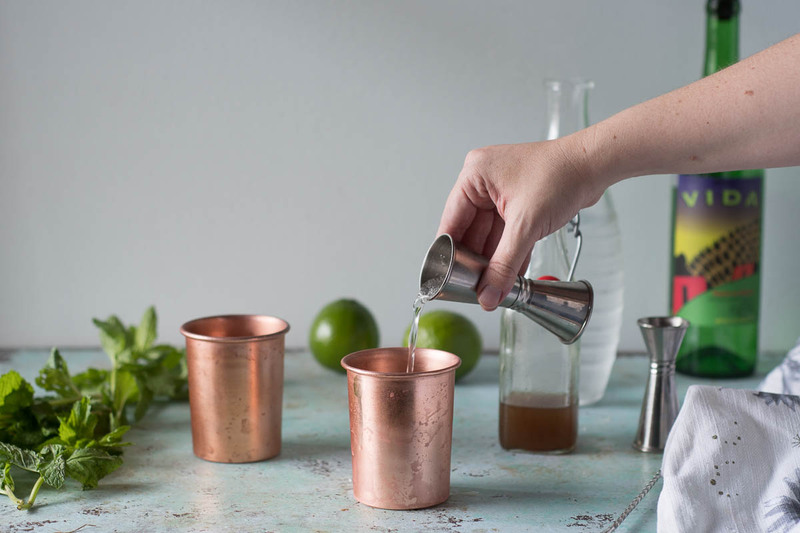 This Mezcal Mule uses mezcal, ginger ale, and lime. And it’s so completely refreshing. Mezcal, if you don’t know it, is an agave-based spirit with a much smokier, richer flavor than the more familiar agave-based tequila. I love the way the smoky flavors play with the sweetness and spice of the ginger ale. 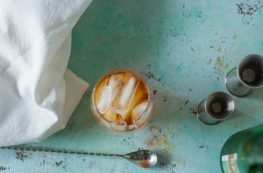 I like to make this with a homemade ginger syrup (which is a cinch to make) and soda water (I love my SodaStream), but I know that most people don’t want that hassle. Use a good ginger ale or ginger beer that you like. My favorites are from Fever Tree, Fentiman’s, and Q (the brand). Then all you need is some fresh-squeezed lime juice (don’t use the pre-bottled stuff) and some ice. I like to garnish this with a bunch of mint for an herbaceous fragrance on the nose. I think it smells nice and makes the drink look pretty, but it’s a totally optional flourish. 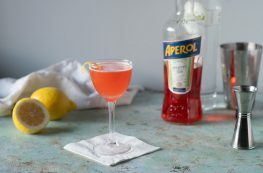 It’s a simple drink that you build in the same glass you drink it in, which removes the need for anything in the way of fancy equipment. 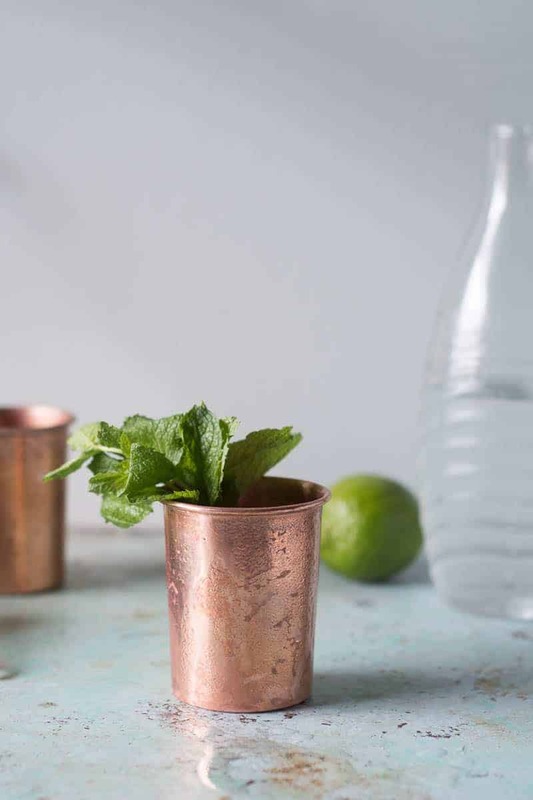 While Moscow Mules are traditionally served in copper mugs (or, in my house, these handle-free copper cups), you can absolutely make them in a basic tumbler or rocks glass. So really, you have no excuse not to make one. Like right now. 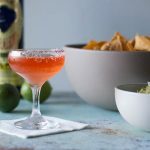 This Mezcal Mule is a variation on the classic Moscow Mule, which is traditionally made with vodka. I love the smoky quality mezcal brings to the combination of ginger ale and lime, but you could certainly use another spirit here (honestly anything from gin to whiskey to rum will be good here) if you like. 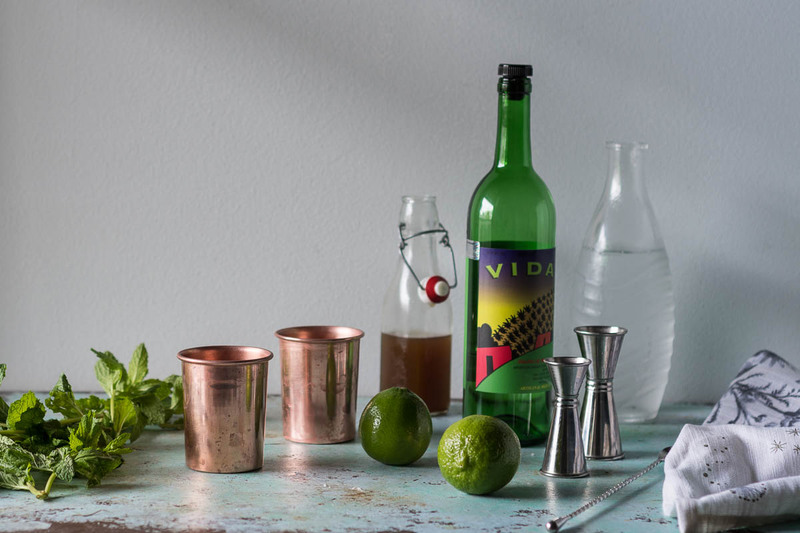 If you're interested in trying mezcal, Del Maguey Vida is a good affordable brand. 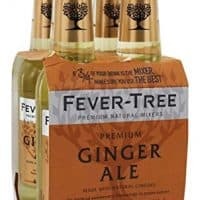 Use any ginger ale or ginger beer you like (I'm a fan of Fever Tree, Fentiman's, and Q). Or, if you've made my homemade ginger syrup, use 1 1/2 ounces ginger syrup and 3 ounces of soda water. Please use fresh-squeezed lime juice and not the bottled stuff here. The mint is pretty and smells nice, but it's totally optional. Fill your glass with ice, add the mezcal, lime juice, and ginger ale. Stir until cold. 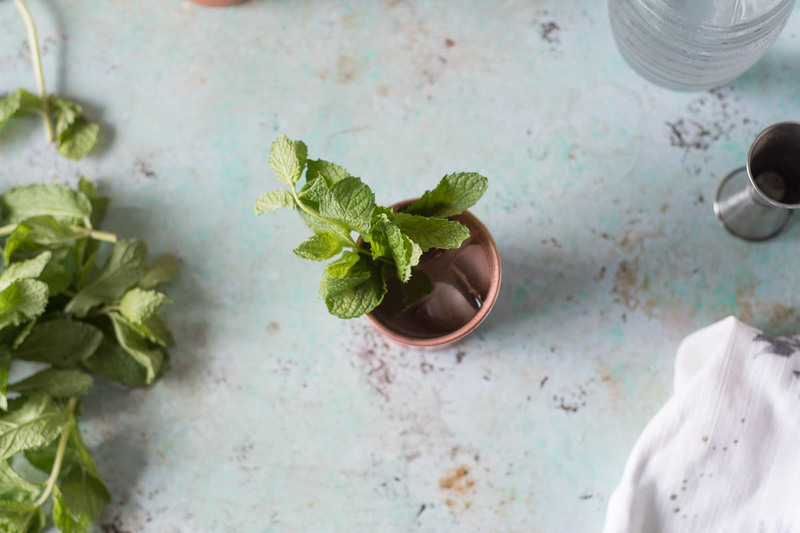 Garnish with mint if using. Serve. I love Moscow Mules! I’ve never tried mezcal before- I’ll have to try switching it out for vodka sometime! Thanks! You should totally give it a try with mezcal! I think the smokiness works beautifully with the sweet ginger heat! This is something new to me. Looks so flavorful. Love the presentation. I just love your photo style. 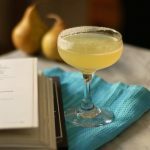 The misty pictures stand perfectly with the mood of the recipe, along with those inviting copper glasses. Love all of it! I love your description of wavy hair in Chicago, and the way the air sweats! I have downright curly hair, and I live in McAllen, Texas (near the Gulf of Mexico). We had weeks of 100 plus temps with humidity nearly to match. My hair goes nuts. All that to say, a refreshing cocktail is always in order IMHO. The mezcal sounds intriguing. I am not much for vodka, and love gin. I think I need to pin this for the near future! Ah, curly hair in humid weather! It’s a constant struggle! You could totally make this with gin (there’s a gin variation called a gin gin mule). 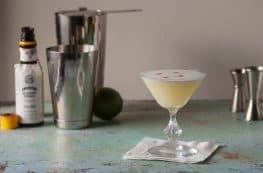 If you’re a fan of smoky flavors then mezcal is worth trying–if smoky sounds like too much, mezcal might not be your thing. It’s oppressively hot here too! I could use one of these right now. 🙂 I’ll have to search out some Mezcal, since that sounds so interesting and I need to try it. Thanks Anne Marie! You totally should!